"It had been on my bucket-list since I was a boy and read Huck Finn," reports Dave Ellingson, college professor and pastor, who paddled the entire Mississippi River in his kayak during the summer of 2012. 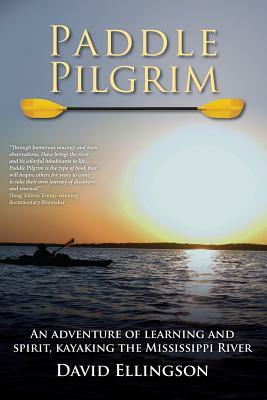 Paddle Pilgrim chronicles this "adventure of a lifetime" and recounts experiences from basking in a sublime sunset in Minnesota to dancing with a snake on an Arkansas sandbar. In addition to painting a kaleidoscope of vivid word pictures of river scenery, Ellingson writes movingly about the "interior landscapes" of solitude, silence, prayer, and communion with creation. "What began as an adventure led to learning and ultimately to spiritual pilgrimage " he says. Ellingson teaches courses in spirituality, environmental ethics, human development, and youth ministry at Trinity Lutheran College in Everett, Wash. He is a Lutheran pastor, Master Gardener, former distance runner and triathlete, and father of five grown children. He resides in Edmonds, Wash.
Grandpa said "You have ants in your pants!" My mother described me as in "perpetual motion." Teachers said I was hyperactive. They were all right. From the earliest age my middle name has been activity. This condition often gets me in trouble. "Can't you just sit still?" echoes from deep in my memory through many churches and classrooms. Finally a coach helped me to focus my energy and I was off and running, literally. But just running wasn't enough. The Forest Gump in me kept running and running and running. When I saw an American, Frank Shorter, win the Olympic marathon, I knew I had had to run that distance. Even after learning that the first runner, a Greek solder running from the Battle of Marathon to announce a victory, dropped dead, I wasn't deterred. I found out on those long lonely runs that it was about more than running. It was about self-discovery, prayer, adventure, communing with nature, and fulfilling my potential. This became the focus on my studies and led to a Doctorate in Holistic Health. Discovering I got stronger the longer the distance, I ran the 100 Mile Western States Endurance Run across the Sierra Nevada Mountains and topped that mountaintop experience by completing the Iron Man Triathlon in Hawaii. All of this activity, however, came with a steep price. Over a 30 year period I wore out my knees and had to have each replaced. I don't run and run and run anymore, but I still need to move and to be active. Living near the water (rivers/lakes/oceans) much of my life I have felt a deep connection with my "water-spirit." I knew as soon as I paddled my first kayak that I had found a wonderful new way to explore both exterior and interior landscapes. The seed of the idea to paddle the Mississippi River was planted when I read two books as a boy. Minn of the Mississippi, by H.C. Holling, tells the story of a turtle's journey down the river and Mark Twain's Huck Finn, shares the tale of two very different people's lives woven together as their raft floats downstream. I honestly didn't know if I could paddle the entire river, but I knew that I had to begin. Once that happened there was no stopping me. And with it came the ultimate irony that I was sitting but not still! And that surprised even me!